Jawa has begun deliveries of its forty-two and Jawa bikes recently. Both the bikes have received quite a good response from the buyers too. Jawa recently released the ARAI certified fuel efficiency score of both the bikes which stands at 37.5 km/l. One of the major attraction of the Jawa bikes is their retro-modern design which has got a lot of people drooling over them. It is expected that modified examples of the Jawa bikes will soon start appearing and with it will come custom aftermarket accessories for the bike. For the same, here is a render design by DESI GEEEK which showcases the scrambler version of the Jawa forty-two. Let’s take a look at the video below before moving on to the details of this Jawa forty-two scrambler. 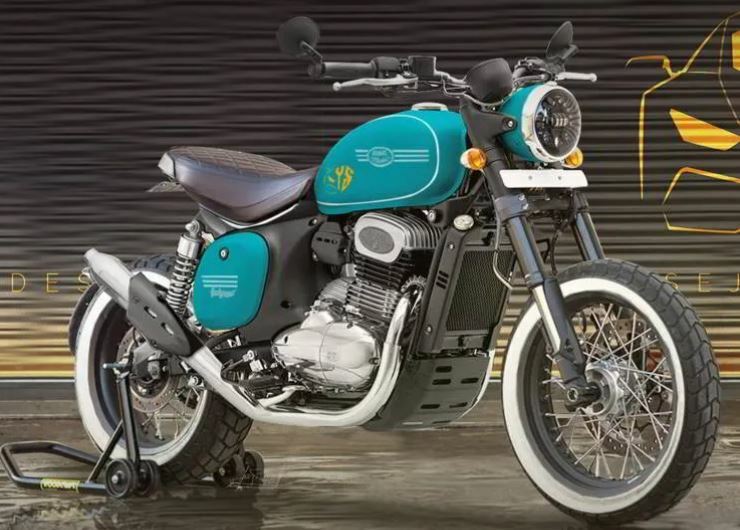 As seen in the video, the concept of marrying the scrambler style with the Jawa 42 looks quite exciting. Compared to the past renders we have brought you based on the same concept, this one is more realistic and maintains the retro-modern look of the bike. Recently, Royal Enfield also launched the scrambler version of the Bullet series motorcycles, called the Bullet Trials. Before the launch of the Jawa motorcycles back in November last year, it was being speculated that Jawa could launch a scrambler bike as well. However, that didn’t happen but we did see the uber cool Jawa Perak bobber at the launch. Coming to the Jawa forty-two render here, it looks quite cool and carries a cyan paint shade. One of the striking points of the bike is its white sidewall tires, which lend a hint of retro-ness to the bike. The tires themselves are all-terrain units which will help to tackle the rough terrain. The rear sub-frame has been chopped and the twin silencer pipes have been lifted up in true scrambler manner. The saddle is a custom unit that further adds to the overall character of the bike. The headlight has been covered with a grille mesh which is a common feature in many scrambler bikes. Talking about the Jawa Forty-Two, it is powered by a 293 cc four-stroke engine that churns out a maximum power of 27 Bhp along with 28 Nm of torque. The liquid cooled engine is Bharat Stage 6 emission norms ready and uses a very distinct twin exhaust design. The engine comes mated to a 6-speed manual gearbox as standard. The first batch of bike deliveries has been done by the company and the next delivery round is expected to happen by the 15th of April. Coming to the Jawa Forty-Two scrambler render featured above, it gives a fair bit of idea how the bike would look like if modified like a scrambler.